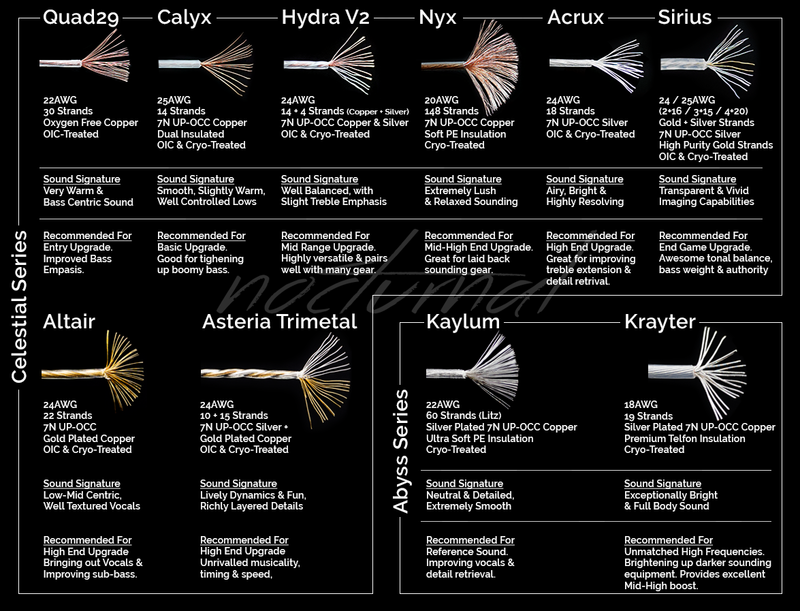 The NocturnaL Audio Hydra, a cable that can be simply summarised with just one word “murderous”. It is indeed the chimera of the Acrux and Calyx. The end result is a breath-taking, mind-blowing sound. This lethal chimera is truly the best of both worlds, giving the advantages of both a Stranded Silver and a Copper wire. As such, these cables are hand-crafted with care by our engineers, making sure that there are no faults in this venomous hybrid design. At the price this cables are at, victims are getting more than what they requested for as these cables will perform impressively with its excellent sound, and visually charismatic design. These cables are forged using only top grade Stranded Silver and Copper wires. The outcome of this chimer is remarkably lethal. A sound that really blows cables within its price range out of the water. Not only are these cables comparable to those within its price range, but it has the potential to even match up and possibly outperform cables that are priced at a way higher range. Performance is what these cables are really targeted at and we are confident to say that these cables will definitely impress anyone who is willing to have a go for its toxicity(addictive sound). Due to its fantastic hybrid design, the cables will look stunning. With the bronze colour of the Copper wire paired with the silver accents from the Stranded Silver wire, you’ll get something that will simply be breath-taking. Not to mention the addition of authentic wooden furniture will give it a touch of class and an exotic feel, making these cables not only sound poisonous but also look equally as poisonous. Overall these cables will look both visually stunning and appealing. In conclusion, these cables were targeted in a way to offer consumers the best value in its class. Its looks is simply amazingly beautiful(and poisonous) and the sound quality from it is simply just lethal(awesome). These cables and the rest of the NocturnaL Audio line up will revolutionize the audio industry and bring a new variety of cable upgrades. All in all, NocturnaL audio cables is truly the road of no return as once you’ve been poisoned by it, there is essentially nothing worth where you came from. Ordered to try out the hybrid cable and got it within 6 weeks of waiting. Initial listen to it was quite disappointed as it sounds thin and distant. But after 10 hours burn-in, the bass tightened up and became more punchy, while mids started to get fuller and the highs extended with more micro details. This cable really feels weightless and it looks fantastic! It is really value for money and is definitely worth the wait. I can't wait for my next upgrade to the 8-conductor on in the future.